Earl Bringing In An Earl-y Autumn? I have a basic formula that I can work with that covers a 25*c temperature variance. This can be accomplished with only six pieces of cycling clothes, excluding gloves/head & face warmers. Warm Weather gear is pretty obvious, and everyone has it. Bibs, Jersey, Gloves. What else do you need? Cool Weather clothes are what I tend to use right before I pull out the tights. Typically, you can go 2-3*C cooler with this setup, but your knees may or may not like you. Use some embro while you are at it. The underarmour/base layer is key in keeping you warm, while still not getting super-sweaty. I found some base layers at Wal-Mart/Target that were under $15, and work just as well as anything else. My Cooler Weather kit is nearly the same as the Cool Weather setup, but now that it is below 15*C, the padded bib tights come are used. These will keep the chill out of your legs, if they do not… you are not pedaling hard enough/need to HTFU. At this temperature, you are probably going to want to bust out a pair of long fingered gloves. The Cold Weather gear is when things get real. It is cold outside; cross riders are questioning whether it is worth being outside or not… heck… the trainer/rollers are starting to look nice at this temperature. Time to bust out the ear warmers, the gloves, the shoe covers/toe covers, and maybe even embrocate while wearing tights… Sounds crazy, but I have heard of people doing such things… The wind vest is essential at this temperature. Layering gives you the option to zip articles up and down, or take things off if the weather changes mid-ride… Having something protect your chest from all of that cold wind really gives you an edge, as compared to wearing a second jersey or something. Maneuverability is not yet compromised. Do I even need to tell you what to wear if it gets any colder than 7*C outside? Why would you even want to ride in this kind of weather when you could be on the Kreitler, watching Scrubs, or American Idol, or whatever people watch these days… What I suggest you to do is take an arm load of your cycling clothes, and throw them, one by one into a basket. Whatever lands in it; you wear it. Simple as that. I really have no suggestions for below freezing, or nearly freezing weather. I seldom ride in these conditions, since I am from the beach originally, and would be a hypocrite to suggest you to. What provoked me to start posting about clothing? Mostly the side effects of Hurricane Earl. Cool weather from the West was pulled to the East, and we caught a lot of it. I think it was 18*C when I left my house for a MTB ride, and was 15*C by the time I got back. TV / Internet was down for about nine hours today; posting this a bit late. With this vital necessity gone, I decided to finish up Bill/Carol McGann’s second Tour de France book. I hit the 1990’s and their prose about a rider that kind of sparked for a while piqued my interest. 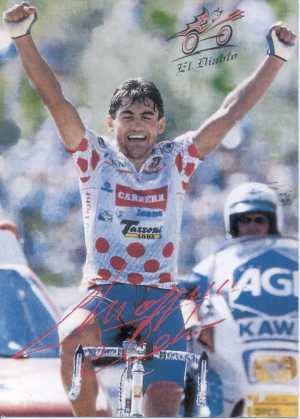 Claudio Chiappucci was around the same time as LeMond, Hampsten, Indurain, etc. I think he was a captain/domestique for Indurain at the time. This guy had panache and took off without a whim sometimes. He kind of reminds me of Jens Voigt. His attitude and riding style was totally different than the conservative sniping attacks of Indurain, and maybe that is what is so interesting. Here is some footage of him in the 1992 Tour. No more paying $80 for a 700c mountain bike studded tire. No more worrying about falling or slipping on ice or snow. No more excuses for gaining five pounds. Cable Cutter – I used an old pair of Bowden cable/housing cutters from my bike tools. You do have one, right? Note: You will need a bike with disc brakes for this to work. Measure your Braided Cable around the edge of where your wheel rim meets the tire. Clip with an extra 2″-4″ for clamping space. Once you have this piece measured, cut three more pieces to this length. Measure the length of chain needed to have the chain reach both sides of the rim. Mine were roughly 5.75″ with a 700 x 51/53 (2.1″) Tire. Clip either 32 or 64 sections depending on how spread apart you want the chain.